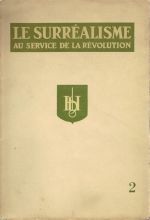 Le Surréalisme au service de la révolution (Surrealism in the service of the revolution) was a periodical issued by the Surrealist Group in Paris between 1930 and 1933. It was the successor of La Révolution surréaliste (published 1924-29) and proceeded the primarily surrealist publication Minotaure (1933 to 1939). After the writing of his Second Manifesto of Surrealism (1929), which announced the expulsions of several prior surrealists due to theoretical differences, André Breton and his supporters developed a new, more politically charged publication. The first issue of Le Surréalisme au service de la révolution was published in June 1930, and was followed by five more issues through 1933. Contributors included André Breton, Paul Éluard, René Crevel, Tristan Tzara, Salvador Dalí, René Char, Benjamin Péret, Louis Aragon, and Luis Buñuel, among others. Issue 2 (october 1930) Features Rapports du travail intellectuel et du capital (Reports of Work and Intellectual Capital) by Breton; a handful of articles on the Marquis de Sade; a chapter from The Immaculate Conception (L'Homme) by Breton and Eluard; and three poems by Péret. Other contributors include Char, Aragon, Duchamp, Crevel, Dalí, Georges Sadoul and Albert Valentin. Art work includes a photograph by Man Ray and paintings by Dalí and Tanguy.